S.W. Fallon (1870-1880) would have slipped through the pages of Indian history if it weren’t for his remarkable records of Indian vernacular languages. With a keen interest in local dialects, particularly their rural and colloquial variations, he recorded words, phrase, riddles, proverbs, idioms and songs along with their English translations. Perhaps his most impressive work is ‘A Dictionary of Hindustani Proverbs’, a collection of 12,500 proverbs and sayings from the Northern Indian regions. Apart from Hindi, Urdu and Punjabi, it also features the idiosyncrasies of less popular literary languages such as Marwari, Bhojpuri, Maggah and Trihuti. Since he largely depended on locals and ordinary people for translations, he ended up featuring, to our great delight, even offensive words and local insults. 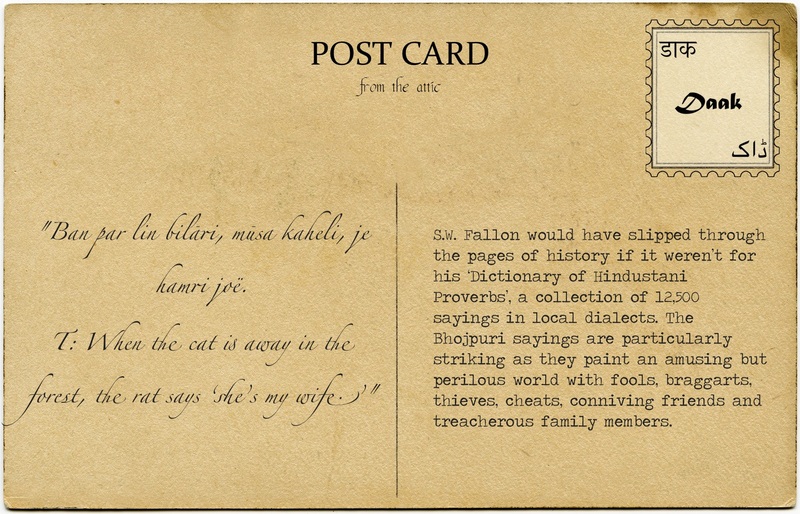 The rhymes, proverbs and sayings in Bhojpuri are particularly striking as they paint a colourful but perilous world with fools, braggarts, thieves, cheats, conniving friends and treacherous family members. They offer an abundance of practical advice, with a pinch of humour, to guard one’s interests and brave the world with caution and suspicion. Bhojpur mein jaihā mat, jaihā to khaihā mat, khahihā to soihā mat, soihā to tohiā mat, tohiā to roihā mat. T: To Bhojpur town go not; or if you go, eat not; or if you eat, sleep not; or if you sleep (your bag) feel not; or if you feel it, cry not. T: On seeing a barber he finds hair even under his armpit. Ban par lin bilāri, mūsa kaheli, je hamri joë. Chhāti par bāl nāhi, bhāl se larāi. T: No hair on his chest, and he is going to fight a bear. Gānth me dām na, paturya dekh ruāi de. T: With no money in his pocket, he weeps to see a woman (unable to wed her).